I Am To Enclose Here with The Copy Of The Government Order Cited, In Which The Govt. Of Andhra Pradesh State Has Declared General Holidays & Optional Holidays For The Year 2019 & Request You To Take Necessary Action In This Matter. NOTE: SRI RAMA NAVAMI/DR.B.R. AMBEDKAR’S BIRTHDAY (14.04.2019) / TAMIL NEW YEARS DAY (14.04.2019) HOLIDAY FALLING ON SAME DAY OF SUNDAY. 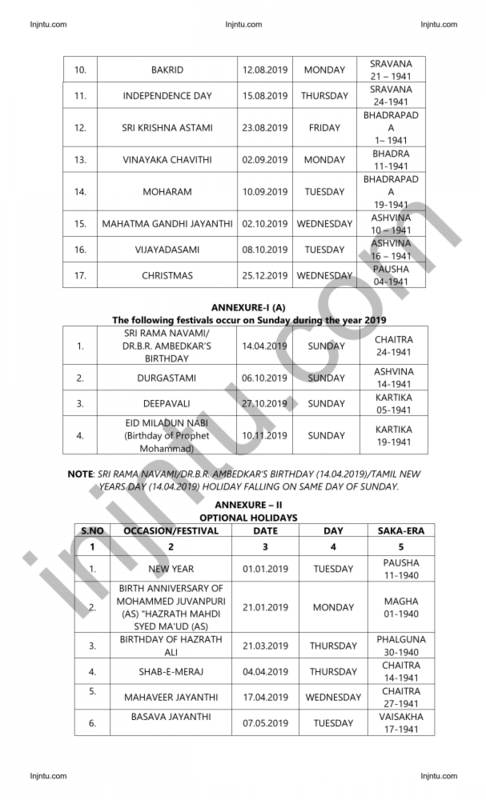 So Above We Have Provided General Holidays and Optional Holidays for the year 2019 For Andhra Pradesh State So Students Who Are Studying In Any Of JNTU Kakinada Affiliated Colleges Can Now Check & Download Andhra Pradesh State General Holidays and Optional Holidays for the year 2019 Official Notification. 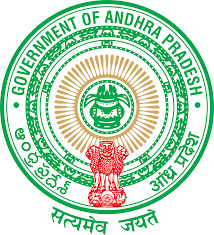 So, Above You Can Get Complete Info Regarding Andhra Pradesh State General Holidays and Optional Holidays for the year 2019 . 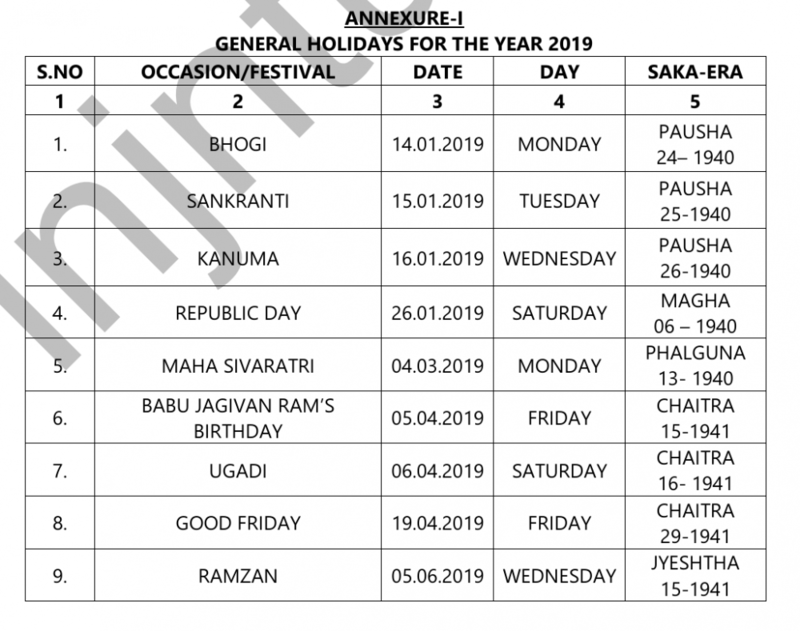 You Can Simply Bookmark This Page As Well In Order To Check All Info Regarding Andhra Pradesh State General Holidays and Optional Holidays for the year 2019 In The Future As Well. So Do Book Mark Our INJNTU.COM Page & Install Our Android App To Get All Notifications About Updates & Results Directly On Your Mobile Phone. 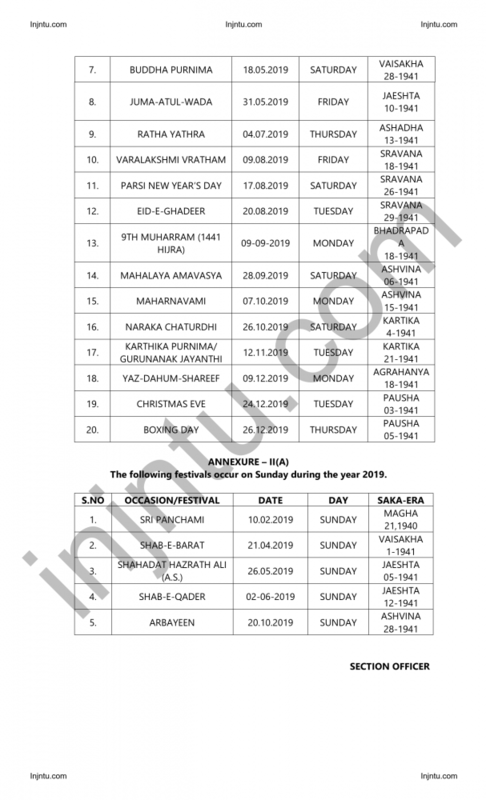 Don’t Forget To Share This Info RegardingAndhra Pradesh State General Holidays and Optional Holidays for the year 2019 Among All Your Friends & Colleagues. Make Them Check Their Info Regarding Andhra Pradesh State General Holidays and Optional Holidays for the year 2019 Also Share This Info On Your Social Media Pages.